CompTIA Security+ Certification certifies the competency of security professionals working in the IT industry. The theft or destruction of information or the disruption of communication resources can result in not only lost time and revenue, but also an irreparable loss of confidence by clients and customers. The ability of computer networks to remain functional continuously for only their intended users has been a necessity to business. Professionals who have Security+ training, who have demonstrated the ability to respond to human and organizational weaknesses by passing Security+ tests, and who have had instruction in cryptography, communication security, can use real-world tools, understand the infrastructure, and haven?t just studied Security+ brain dumps will demand the respect of the IT industry. Your success in our Security+ training will result in not only passing Security+ tests, but also success against those who would steal, destroy, or disable your business. Start your certification training today! This CompTIA Security+ course from is designed to let you obtain your goal of becoming security professional in the IT industry. We provide you with state-of-the-art courseware that will prepare you for your exams and a successful career. 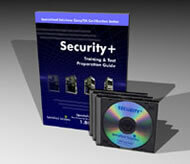 Anyone wishing to obtain a network security position in a corporate environment.